VIS300-7M2 is SVATs hands free 2-wire indoor/outdoor color video intercom system. Feel secure when you or your children have to open the door for strangers. 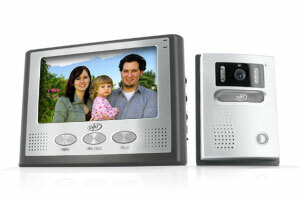 The convenient, compact system uses both video and audio to alert you when someone comes to your door. Hands free operation allows you to see and hear who is at your entrance before deciding whether or not you want to answer. The VIS300-7M2 can be used on its own to monitor your entranceway or can be used as an effective and simple addition to your existing security system. Always be aware of what is happening at your business or home entranceway with the night vision camera that allows you to see in the dark, up to 8ft away. Mounting the camera and monitor is easy with the included angled mounts and built-in stand, allowing you to set it up your VIS300-7M2 in minutes! SVATs VIS 300-Series video intercom system is incredibly easy to set up and use. It can work with your existing door bell wiring, so you can do everything yourself within minutes (50ft cable included). The video, audio and power all run through two wires, so no additional or complicated wiring is necessary.